Zhanna has been my favorite hero since I started playing in the early days of Call Of The Crystals (COTC). In Dark Prophecies (DP) and especially in COTC, Zhanna had no autoloss conditions using a standard deck – featuring The King’s Pride (TKP), Retreat, Healing Touch (HT), and Focused Prayer (FP) while mixing in Tainted Oracle (TO), Elizabeth Winterborn (EW), and Wizent’s Staff (WS) for draw. She had no consistent way of dealing high damage (like a Mage’s Fireball) or instant death (like a Rogue’s Assassinate) to an opposing ally but the constant knowledge of Tidal Wave kept opponents at bay. The opponent had two routes – play into Tidal Wave or play single allies that get bounced by a Retreat/Banish or get locked by Jasmine Rosecult. It was a golden age for Zhanna. 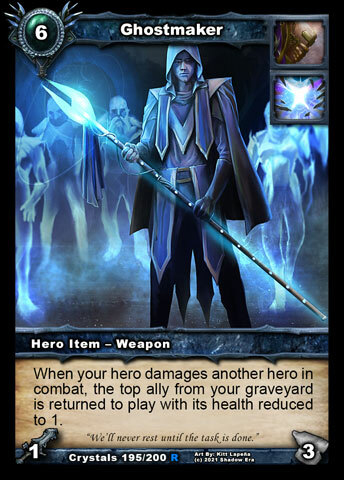 Shattered Fates (SF) introduced new heroes and new cards across the board for all classes. Already difficult matches for Zhanna became even more difficult. Discard Zaladar, Wulven Moonstalker, Serena, and Homunculus Aramia are all vastly difficult for a standard Zhanna deck to compete with. The slow and steady pace of the old style of Zhanna became no longer good enough. Hope came in the form of Glass Chalice Of Knowing (GCoK) allowing Zhanna to pick the cards that she draws albeit not as fast as WS. We also bring an unsung companion of DP, Braxnorian Soldier, into the fold with the advent of many haste decks. We have a faster way of building resources through the new Devoted Knight, which goes into the top of your resource pile when he’s killed. We also have a slew of new fatties popular with Zhanna players: Viska, Nathanias, and Eriss Fateweaver. The new Zail’s Hymn (ZH) provides a permanent Jasmine effect on an opposing ally. There’s quite a variety of Zhanna decks that can be built but rarely do you get the feeling of never having a bad matchup like in the days of COTC and DP. Both decks play very similarly. The deck by ragosnos has a little more in fatty presence and a little more draw. The deck by chamthabo has more in the way of healing and 3cc ally presence. With that in mind, ragosnos’ may fair better against mid-range and chamthabo’s may fair better against rush. This is the ever popular build that topped the QM ratings in the beginning of SF. Its downfall came at the hands of rush Aramia and wulven Moonstalker. It plays very well against all other decks including hunters such as Banebow and Baduruu. It still plays control as is Zhanna’s natural tendency but once TKP is setup it will attack quickly. In the current version of 2.88, this is my favorite Zhanna to play with. It takes tremendous piloting skills as you don’t have the control options such as Retreat, Banish, and ZH. Instead, you time your Tidal Waves and stall the board with a threat to draw out additional allies when you need to. Otherwise, you are continuously dropping fatty after fatty with TKP shining in the background. This style will still have trouble against the current rush Aramia but has performed well in all other matches. Working tirelessly with SamuelJ, I will showcase the deck here. At the top of the list, you have DK for resource generation and EW for extra draw. After that is a variety of fatties that all serve their purposes. Raven Wildheart – still an excellent board control option for neutralizing opp allies. Braxnorian Soldier – allies with 3hp or less can’t attack him plus he stops opp from being able to use haste. Aeon Stormcaller – always the Zhanna favorite buffing and protecting your allies. Eriss Fateweaver – the bane of undead and warrior decks with a high attack and health value. Nathanias – truly a beast of an ally with the benefit of extra draw and free ally play if you’re lucky. Word of the Prophet – excellent for finding that choice fatty, FP, or TW but a great play on t1 to follow GCoK play and ability on t2. Forgiveness – extra SE for draw and not having to worry about your first 4 sacs. Since you have 4, you sac up to 4 before playing any so you don’t get null draws. Focused Prayer – don’t leave home without it. Serena, Aramia, Zaladar, and the list goes on that depend on their items and abilities. Tidal Wave – we hate to rely on it and opp’s hate to see it. Glass Chalice of Knowing – what a great combo with Word of the Prophet and Forgiveness. you will always draw what you need having these around. T4 – Elizabeth Winterborn (if DK is still alive), otherwise Branxorian Solider/Raven Wildheart or Tidal Wave if needed. Word of the Prophet plus another Devoted Knight is also an option. Other playstyles for Zhanna aren’t as popular as the three main styles. Mainly because they are harder to setup consistently and therefore have trouble keeping up with standard decks of other heroes. Zhanna Templar Attachment is a fun style to play. It involves using Templar allies with the Strength of Conviction attachment. Having Divine Connection makes this attachment free as does Zalien Crusader. 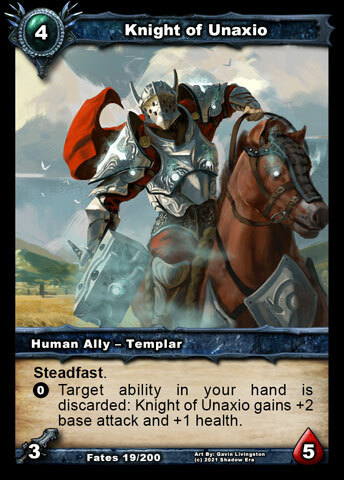 Knight of Unaxio will discard an ability from your hand making him 5/7 then a Strength of Conviction turns him into a 7/7 which is a very strong ally for cheap. Using For Unaxio and Confluence of Fate can provide quick, easy draw in the deck but require Zhanna’s ability to be strictly used on herself to keep her health up. Zhanna Twilight Mourneblade uses the easily to-get-killed Twilight allies to buff her Mourneblade weapon. 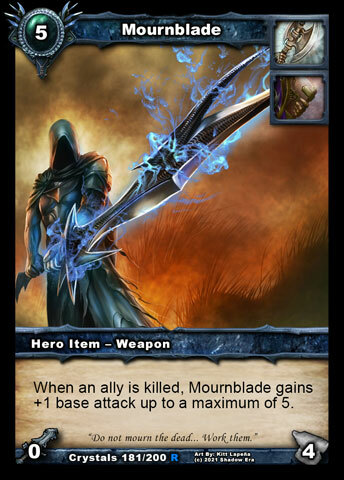 With Twilight Eidolon providing extra draw, you can also use it to keep allies in play after being killed which will buff your Mourneblade and Twilight Champions that are in play. Strength of Conviction is a viable attachment in this deck. Growing Bog-dweller ally and Final Flourish ability also sync in this style of play. Demetreyo acts like a Mage’s Fireball in this deck. Treasured Heirloom is another viable attachment to use for draw in this deck with allies that are easy to get killed. Zhanna Discard Ghostmaker is sometimes used with Threbin who can bring back two allies at a time with his ability but Zhanna has the ability to heal through more damage that you are likely to take as well as healing allies brought back from the graveyard. It involves using Glimmer of Hope and Crystal Shards to get allies into your graveyard to be brought back by Ghostmaker. Allies like Tainted Oracle, Erika Shadowhunter, Devoted Knight, Armored Sandworm, and Fortified Wisp play well in this deck. Since most of your allies will be playing with 1hp, Campfire Stories and The Bigger They Are often make an appearance. Breastplate of Vitality is sometimes chosen over The King’s Pride to give your allies immediate health. Even Nurturing Spring and Good Ascendant are considered in this deck. Using Good Ascendant and Campfire Stories makes Knight of the Golden Dawn a viable option for an ally. Plague is a card you’ll sometimes see in Zhanna decks that are 45+. The goal here is to get yourself established with TKP and allies on the board then drop a plague to make it more difficult for your opp to come back from it. Ice Storm is sometimes used in decks that strictly use Braxnorian Soldier as their fatty. The purpose here is to bring the opp allies out of health range to attack Braxnorian Soldier. Tome of Blessings and Legion United make quite the pair together in attachment decks. Tome makes all your allies take 2 less damage from combat when they have an attachment and LU makes all your allies take 2 less damage from abilities. If you use Blessing of Protection as the main attachment, the ally takes 2 less damage from combat and 3 less damage from abilities making it quite the tank! Reinforced Armor would have a similar effect but with the numbers reversed. Twice Enchanted Robes will sometimes show up in attachment decks that use Confluence of Fate. That’s because the damage you take every turn from Confluence triggers the Robes for extra draw. If you get this setup, you’ll have a full hand nearly every turn! Sacred Firewalker is an attachment some Zhanna players use when teching against mages or most shadow heroes. The ally with it attached is immune to fire damage (i.e. Fireball, Supernova, Furrion Terror). Phew. That’s certainly a lot to absorb. So many different ways to play Zhanna. It’s like a new game in every deck. Hope you enjoy her! Nice write-up. My take on Fat Zhanna was that it tended to also have 50-60 cards. My current one has 55…essentially it’s similar to yours but has much more draw and much more control in the form of Banish and Zail’s Hymn. I suppose it plays a bit more like a stall deck than your example. Yeah I remember seeing your Fat Zhanna before. I thought of this from watching and play with haste zhanna. I really like being able to T1 Kris and immediately play T2 GCoK while using its ability right away since I have the space. T1 WotP + T2 GCoK will virtually guarantee all your plays. I actually watched SamuelJ against Serena use WotP, found GCoK and used the ability, use WotP again, finally pulling a much needed Tidal Wave. Super cool! One other style that I’ve occasionally seen is a pure stall deck…essentially it uses tidal waves, control, curses and massive amounts of healing. I don’t think it’s consistent enough to be competitive, but it’s annoying to play against. Zhanna’s cool like that. So many different styles of play! Indeed, very nice Profile Starval! Great job! Zhanna is a beautiful hero and is very much fun play with her.